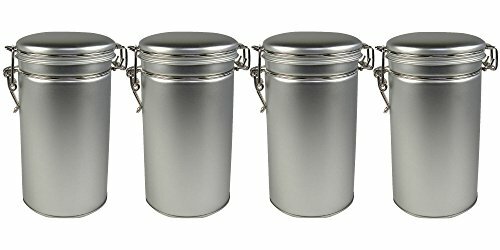 Keep loose leaf tea, coffee, spices, and other dry goods fresh with this set of 4 latched lid storage tins. Made of food safe and high quality tin plated steel with an elegant brushed chrome finish, these long lasting, durable tins feature an easy to use latch clasp with a plastic ring seal that blocks out light and air for rich and full flavored spices, coffee, and tea. The tins measure 6.5 inches tall by 3.6 inches wide and hold approximately 12 ounces of dry goods each. Carefully packaged in bubble wrap for a dent and ding free finish, these tins are a must have for tea lovers, spice lovers, and coffee lovers alike. Hand wash only. Do not submerge fully in water. View More In Food Tins. If you have any questions about this product by Storage Tins, contact us by completing and submitting the form below. If you are looking for a specif part number, please include it with your message.